A stunning, yet simple Gluten-Free Peppermint Brownie Ice Cream Cake. No need to buy a gluten-free ice cream cake from the store, this one is simple to make and perfect for sharing. This post is sponsored by Enjoy Life Foods. Opinions are my own. Scrumptious brownie layer topped with ice cream, crushed candy canes, and chocolate sauce – this gluten-free ice cream cake is going to be a new favorite! This Gluten-Free Peppermint Brownie Ice Cream Cake iso dairy-free, nut-free, and egg-free, making it the perfect dessert for most dessert enthusiasts. When I think of the holiday season, I think of family, friends, decorations, and candy canes. I love decorating cookies, stringing up lights, and stirring a good candy cane into hot chocolate. In my opinion, chocolate and peppermint go together in almost any dessert. 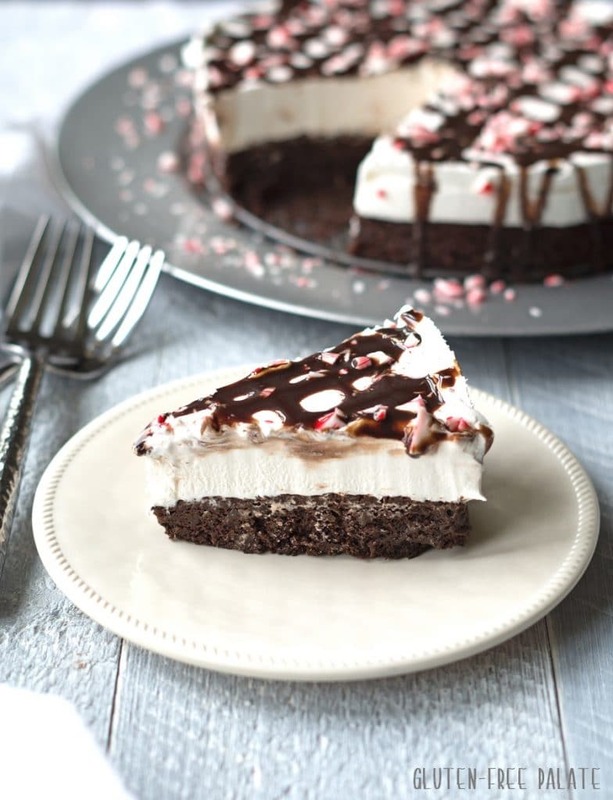 This holiday season I wanted to make something new, fun, festive, and loaded with chocolate and peppermint – Gluten-Free Peppermint Brownie Ice Cream Cake. It’s a scrumptious gluten-free ice cream cake with all of my favorite things. This Gluten-Free Peppermint Brownie Ice Cream Cake, like most of my dessert recipes, is super simple to make. I used Enjoy Life Foods Brownie Mix, dairy-free ice cream (or whipped cream if you want it lighter), crushed candy canes, and chocolate sauce. That’s it! And doesn’t this gluten-free ice cream cake look like one of those ice cream cakes you’d purchase at a specialty bakery or ice cream shop? I can get Enjoy Life Foods mixes in my area. What else can I use? You can use your favorite gluten-free brownie mix, or my gluten-free vegan brownie recipe. Really what you want is a yummy gluten-free brownie layer for the bottom. I used a spring foam pan for this cake so I could show you the sides and inside of this gluten-free ice cream cake. You can use a regular cake pan if you don’t need to “display” the cake in it’s full Gluten-Free Peppermint Brownie Ice Cream Cake glory. To be honest, it’s easier to slice and serve from the spring foam pan than a regular cake pan. Can I use ice cream made from dairy for gluten-free ice cream cake? Yes, you can but then it won’t be vegan. If you don’t need to eat dairy-free or vegan you can use your favorite ice cream in this gluten-free ice cream cake recipe. Same goes for the brownie layer and the chocolate sauce, you can use your favorite. A little secret, this recipe is super versatile and it will work with almost all types of ice cream and any chocolate sauce. 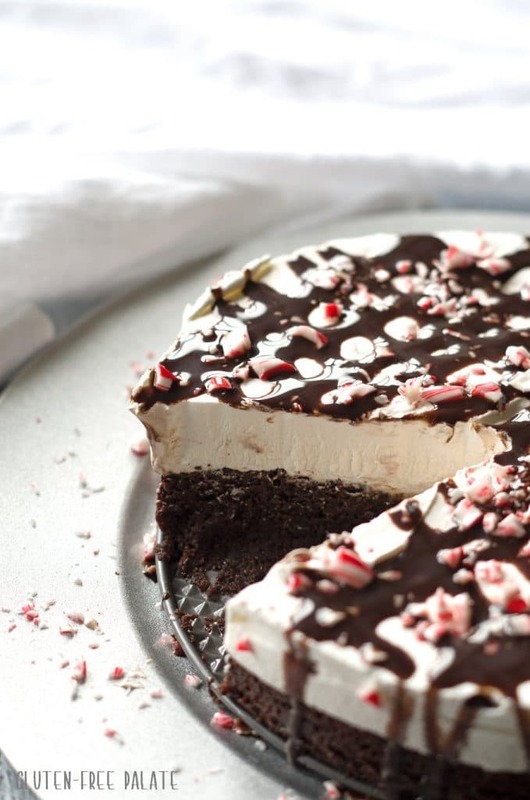 Don’t be nervous to make this Gluten-Free Peppermint Brownie Ice Cream Cake. It really is simple, and anyone can make it. 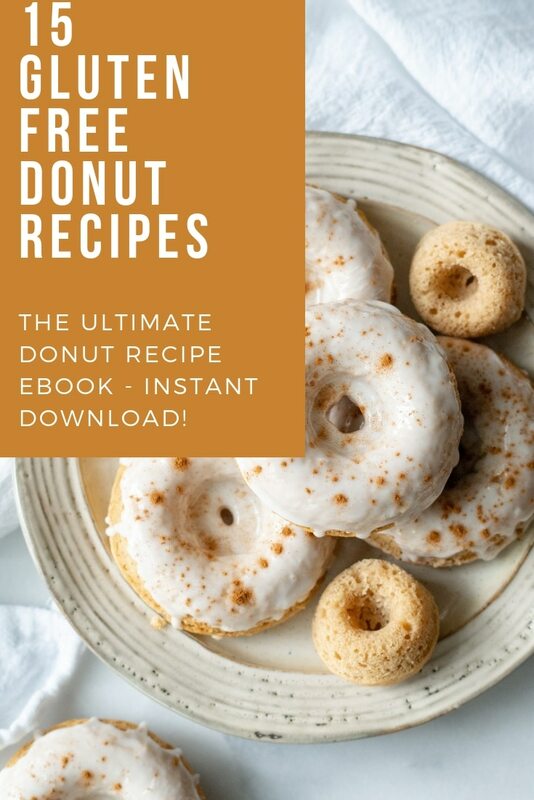 This next year I might see if I can develop a no-bake version, that way it’s even simpler. If you love chocolate and peppermint and gluten-free ice cream cake, you’ll love this Gluten-Free Peppermint Brownie Ice Cream Cake. You can enjoy a slice at a time, and freeze the leftovers for up to three months. Check out my Gluten-Free Chocolate Peppermint Dessert Shots and my Peppermint Cookie Bark for more peppermint treats. 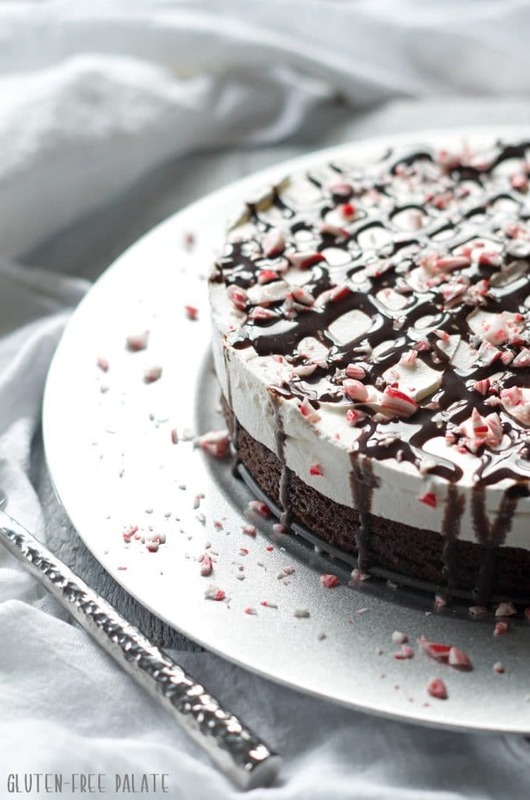 Looking for more chocolate + peppermint desserts? 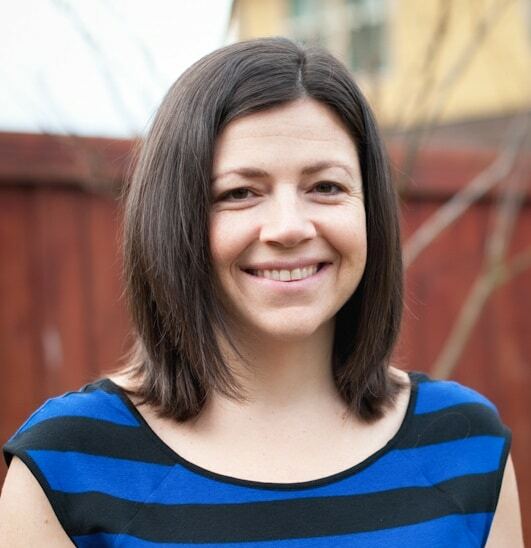 Katie from Healthy Seasonal has a delicious, creamy Peppermint Patty Cheesecake that I’m sure you’ll love. Just make sure the cookies you use are gluten-free. If you need a grain-free option, Taylor from Food Faith Fitness has an amazing grain-free Chocolate No Bake Peppermint Cheesecake Cups. 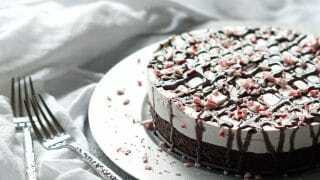 A stunning, yet simple Gluten-Free Peppermint Brownie Ice Cream Cake. Scrumptious brownie layer topped with ice cream, crushed candy canes, and chocolate sauce. It's also dairy-free, nut-free, and egg-free, making it the perfect dessert for most dessert enthusiasts. Pre-heat oven to 350°F. Line a 8 inch springform pan, or cake pan with parchment paper; set aside. In a large mixing bowl, combine brownie mix, melted dairy-free butter, dairy-free milk, and peppermint extract. Scoop batter into the prepared pan and spread until even. Place sprigform pan on a rimmed cookie sheet and bake for 35-40 minutes are until the center is set. Once cool, add ice cream to the top and spread until even. For the chocolate sauce, melt chocolate 30 seconds at a time until melted, stirring in between each 30 second interval. Add 1 tablespoon oil to chocolate and mix until combined. Drizzle chocolate sauce over ice cream cake. Sprinkle on crushed candy cane. Place in the freezer for 2 hours or until set. Remove from the freezer 5-10 minutes before serving. I would love to bring this to a holiday party! Look at those gorgeous photos! This sounds incredible. I love brownies with ice cream! Oh my gosh this is beyond gorgeous. And looks beyond delicious! A brownie base! You just changed the ice cream cake game. 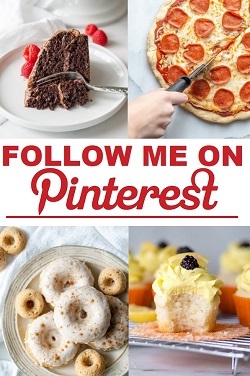 This is seriously the best kind of dessert and has a little something for everyone. This is a great idea, I need to do this to my Brookie Ice Cream Cake. This is a fabulous dessert! Who doesn’t love brownies, ice cream and peppermint? No one! This would be perfect for our Christmas Eve party! It’d be a huge hit! 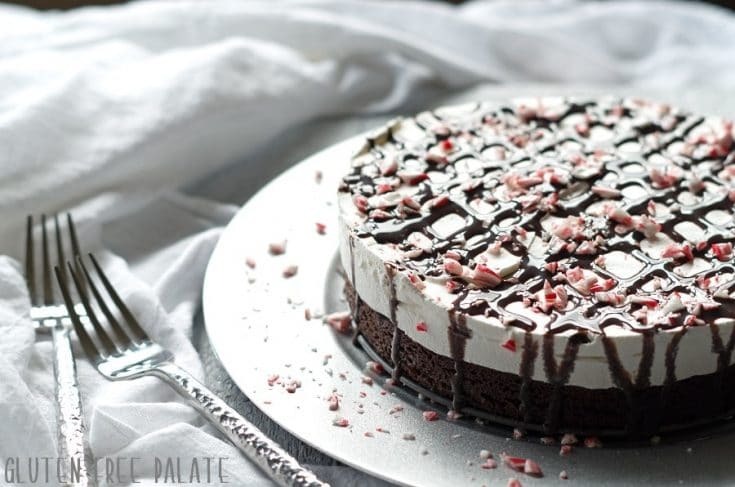 I love the combo of chocolate and peppermint and this cake looks beautiful Chrystal! Perfect for holiday parities. This would be a showstopper at any holiday party! I have been searching for safe candy canes. All the ones I have found in Canada have either May contain wheat or made a facility the processes wheat ingredients. My daighter also just jnformed me she sent santa a letter asking for GF candy canes…. Can you guys find Bob’s Candy Canes or Starburst Candy Canes in your area? They are gluten-free, and are processed in a gluten-free facility. Looks amazing! Could you tell me what size box brownie mix to get? This recipe was designed with the Enjoy Life Foods 14oz brownie mix but any of the gluten-free brownie mixes that are 14-16oz should work. If you use a different mix, follow the instructions on the box (don’t add the butter and milk noted in the recipe), and then add the peppermint extract to the brownie batter before you pour it into your pan. Once it’s baked, top with icecream, and melted chocolate or chocolate sauce.